...finally getting my full review up! 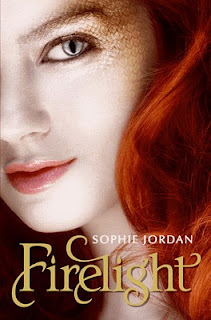 With her rare ability to breathe fire, Jacinda is special even among the draki—the descendants of dragons who can shift between human and dragon forms. But when Jacinda’s rebelliousness leads her family to flee into the human world, she struggles to adapt, even as her draki spirit fades. The one thing that revives it is Will, whose family hunts her kind. Jacinda can’t resist getting closer to him, even though she knows she’s risking not only her life but the draki’s most closely guarded secret. **spoiler alert** I don't think I've read anything in the last 10 years with a dragon as a main character. Sratch that...draki. I wasn't too sure what to think at first, but like many of us, the cover art reeled me in. What's up with all the crazy beautiful red-head covers in YA? In the end, I read in less than a day. During Jacinda's little flying adventure with her BFF Az (event that led to her fleeing village), she meets a boy who is with a pack of hunters. Actually, the boy and his group are hunting Jacinda and her friend. The "encounter" is short-lived and rather touching. Of course, the boy turns up later in the story. We expect it and we want it to happen. Jacinda and this boy have a connection that the two of them don't understand. He keeps Jacinda's draki alive in the dry desert, and the boy is drawn to Jacinda for reasons we don't understand (until the end). Characters are developed - we feel for each one. Tamra, the sister who wants to be a normal teen. The mother who wants to keep her children safe. Jacinda who wants to be who she really is, a draki. The plot has a beginning, middle and end. (you know sometimes books don't have those) The story flows naturally and with a purpose, but there are a few surprises for us. I only have one itsy-bitsy-tiny complaint. Not even a complaint really. The term "Indian-style" was used when Jacinda needed to sit down. Eeeeek in my book, but easily forgivable! Banished (Firelight 2), Jacinda will spend 1/2 of the time back at the pride where she has trouble getting along with Cassian's sister. Cassian's sister is a Visio Crypter - she can blend into her surrounding like a chameleon. In a sense, she is invisible. She's also a big brat! If anyone would like a bookmark and/or sticker....I have some for you (thx to Sophie). Comment with your email below.